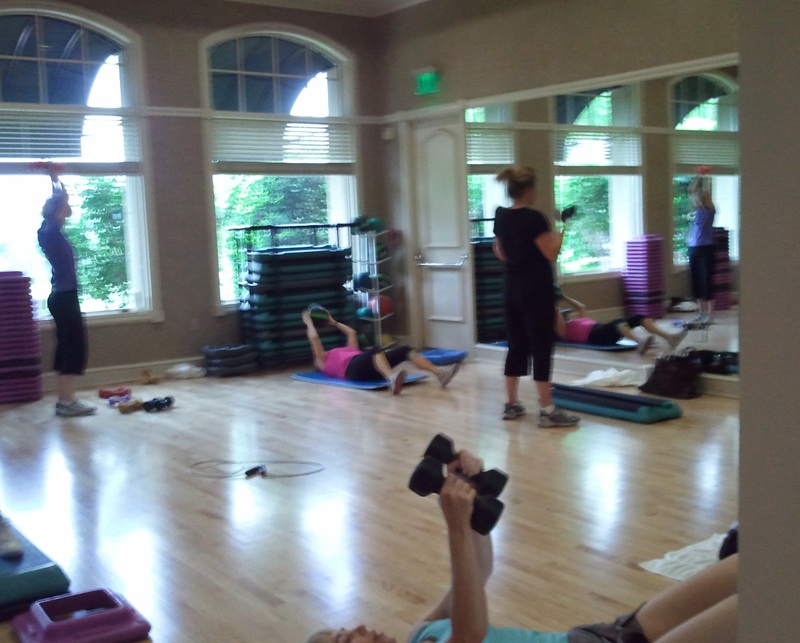 On Saturday morning our instructor at the gym said, “Would you like to do stations today?” Everyone enthusiastically said they’d like to try something different! So she set up areas all around the room with equipment and exercises with which we were very familiar. She reviewed how to do each exercise (that we knew from previous lessons) and then assigned each of us to a station. We spent 1 minute working out continuously at each one, and then our teacher told us to switch as she watched the clock (so we wouldn’t get worn out and not want to do the next one). She planned for a balance of what we would practice at each station… some for upper body, others for lower. We had a jump rope station, the chest press station with free weights and a bench, the kettlebell station for lower body strength, a biceps curl station with a body bar, a station for crunches with a medicine ball, the “plank” station on a mat, the ball rollup station with a large exercise ball, and the triceps station with free weights, to name a few. We got a great workout and had fun. The time flew by! At the end of class, our instructor asked if we’d like to have stations on a regular basis. We all said we would. She’ll vary the activities from time to time so we don’t get tired of the routine. I kept thinking of all the parallels between what we did here and literacy and math stations. As I work in K-2 math classrooms this week, it is the fourth week of school. We are still busy introducing stations and are starting to teach students to use the management board so they can work independent of the teacher. We have not yet started small groups. During the time children are going to these early-in-the-year stations, we are walking around, observing and talking with children about what they are working on and learning. This is a great time for informal assessment. One pattern I noticed this week was the noise level when the whole class was working at stations… in every classroom I’ve worked in! It is still a bit noisy at times, as children are learning to monitor their voices. They still need our help in doing this. As soon as it gets too loud, we stop the children by using a chime or by clapping a pattern (which the kids repeat). Don’t yell to get their attention. Be careful what you are modeling. Then we ask the students why we stopped. EVERY time they say, “It was too loud in here.” They know it’s loud, but they don’t know how to get their voice levels down. My favorite tool to use to help kids be on “noise alert” is a music wand from www.treeblocks.com. I have used these in every video we’ve made. Simply ding the wand and it’s an instant noise alert. With practice, children will learn to control their voices. But it does take practice… and support from us, their teachers. Another option is to use a tambourine, a bell, or a chime to get students’ attention. Another thing you might try is a teacher-made “noise-o-meter.” This can be a visual reminder of our expectations for the class. When using math stations, it’s really important to use a “math mat” or a soft mat to keep things quieter. Working with manipulatives can easily escalate the noise factor. I like to use soft, foam shelf liner cut in large rectangles as math mats. Or solid plastic placemats work really well too. Or even a rectangle of fun foam. You just need something to soften the sound of dice, blocks, etc. This week I’m working in Lafayette, IN, home of Purdue University and thoughtful, caring teachers. As part of our training, we looked carefully at the drama work station, a station that often strikes fear in the hearts of many educators! I showed a video clilp on how to introduce the drama station in a 1st grade classroom from Launching Literacy Stations. At this station, two children work together to read or retell a familiar book. In the video, we use the book, Hobbledy Clop by Pat Brisson. It’s a cumulative tale with lots of opportunity for children to join in with the repetitive line, hobbledy clop, as well as to participate in making sounds, such as meow and ssssss along with the animal characters in the book. A great resource for books to retell, complete with retelling pieces ready to use is www.kizclub.com. Click on the Stories and Props. Below each book pictured, click on color for a colored version of related props for that book. Click on B & W for a black and white version of the same retelling pieces. Note that some of the stories there have more pieces than you’ll want to use for retelling. Choose wisely. For more ideas on using a Drama Station in your classroom, see the following chapters in my books: In Literacy Work Stations (for K-2), read chapter 6, Drama Work Station. In Practice with Purpose (for grades 3-6), read chapter 9, Drama Work Station. If you try the drama station, please send us pictures of your kids at work and your favorite ideas for this station. Send them to d.diller@live.com and we’ll share them with others. Enjoy this fun station with your students! Our chart on "What Makes a Good Book for Retelling"
During back-to-school workshops, teachers from art, music, and P.E. often attend our training on work stations. Often, I’m pleasantly surprised by the creativity of these folks and how they adapt work stations to match their special subjects! Jennifer Bartos, the music teacher at Ford Elementary School in Denver, CO., came to my after-school session and shared what she’s been trying in her classroom with music stations. I LOVE it! She does things a little differently, because she has many classes each day with lots of different students. But she makes it work for her! Here are a few of the stations she is using with her 3rd-5th graders on the stage in the auditorium, nonetheless!